Jeff McKay address supporters at his campaign kickoff event. 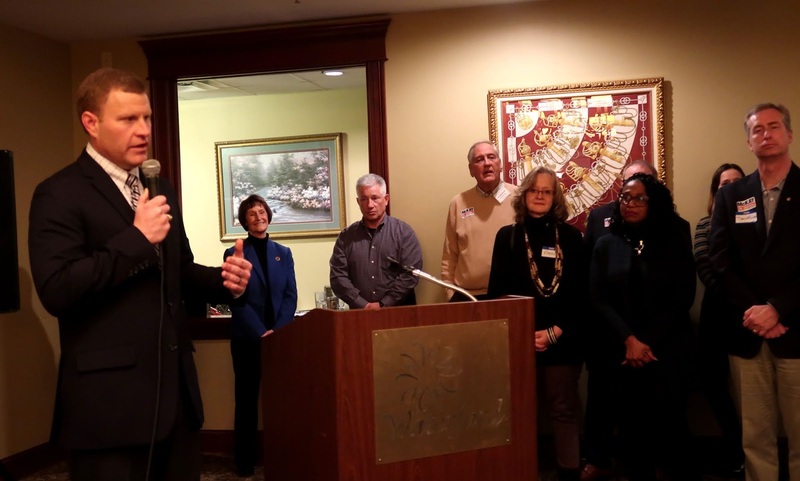 Jeff McKay has the experience and competence it takes to be an effective chair of the Fairfax County Board of Supervisors, Rep. Gerry Connolly said at McKay’s campaign kickoff event Jan. 12 in Springfield. McKay has represented the Lee District on the board for the past 12 years. Some of the supervisors, school board members, and state legislators at the McKay event. Republican Supervisor Pat Herrity (Springfield) still hasn’t decided yet whether to run for the position of BoS chair, he said at a meeting of the Mason District Republican Committee Jan. 12. The current board chair, Sharon Bulova, will retire when her term is up Dec. 31. Primary elections are June 11. The general election is Nov. 5. He touted his leadership on the board’s legislative committee, where he advocated for expanding Medicaid and restrictions on firearms, and the board’s budget committee, noting that for the first time in over 20 years, the board last year fully funded the school system. McKay vowed to ensure schools remain “Fairfax County’s number-one priority.” His agenda includes expanding prekindergarten and school safety. He lauded the One Fairfax policy adopted by the BoS and school board, which calls for both bodies to “look at everything through an equity lens to lift up the most disadvantaged people.” Under One Fairfax, county leaders look at “what is wrong in society that we can fix systemically,” he said. Fairfax County has a “moral responsibility to lead the commonwealth of Virginia on environmental issues,” he said, which includes being a leader in attaining zero-carbon emissions and removing the restraints that prevent solar installations on schools and county buildings. Other items on McKay’s agenda include working with nonprofits to develop more affordable housing, support for mental health counseling, and standing up for county employees when their benefits and pay are threatened. The fastest way to insure this county's decline is to keep electing the same type of politician over and over. The county needs someone with a fresh perspective to take over. That's why I support Tim Chapman.